Walk into any sports stadium and you'll see them. Retired numbers, hung up in the rafters or on the fences. Retiring those numbers honors the greats of that particular sport. No player on the Chicago Bulls will ever wear the number 23. No player for the 49ers will ever wear number 16. No player for the Boston Red Sox will ever wear number 9. 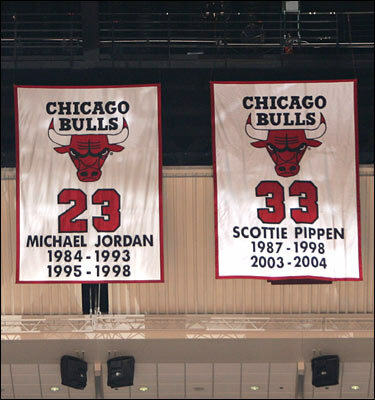 Michael Jordan's number hangs in the rafters in Chicago. In our sport we have the same legendary riders and horses. Of course riders don't have numbers that they keep from show to show, nor do horses. But horses do have show names. Some show names are unusual and unlikely to be reused. Take Rox Dene or Isgilde for example. But others are more common, and pop up in current day, their owners likely unaware they've christened their mount with such a meaningful moniker. I'll be judging the children's and in walks a horse that's announced as Master Dan or Cap and Gown. I've gulped when listening to the announcer say, "Now on course, Touch of Class." Touch of Class, photo courtesy of Phelps Sports. That's where the USEF could step in and retire certain names. Only the best of the best--the horses inducted into the Show Jumping Hall of Fame or the Show Hunter Hall of Fame. At the very least there could be a web page with a list of the most famous horses and ponies for people to refer to so they don't make the same mistake. Certain shows could even have names "retired" on their walls--shows where that horse won year after year. The Idle Dice Open Stake at Devon has this idea in mind. Why should we not truly honor the greats of our sport? 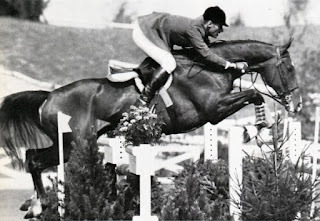 Kim Ablon Whitney's is an 'R' judge in hunters, equitation, and jumpers. Her latest novel is Hunter Derby.